When architect Renzo Piano speaks about the Whitney Museum of American Art he uses his entire body to illustrate the artistic intent of his new building. During the museum’s official dedication ceremony he gestured first to the east, and a view that cuts across Manhattan Island. “This building talks to the city,” he said, then turned left and pointed to the Hudson River. “It also talks to rest of the country: all the way west, to Los Angeles, if you look carefully,” and then to the world beyond. This new building, with its massive windows and expansive 360 degree views, seems designed to enable a sort of outward-looking contemplation and engagement that most museums, with their emphasis on what’s inside, right in front of you, don’t encourage. “I’m pretty sure that beauty will save the world,” Piano said, and this new home for one of the country’s foremost collections of American art makes the point at every turn that all the beauty inside is made more powerful by its connection to a greater, wider landscape. The original 1609 shoreline and the High Line. Map by Marty Schnure. The huge complex of buildings across the street from the Whitney, the West Coast Apartments, is another example of ingenuity: modern commercial refrigeration was pioneered here. In the late 1890s, the Manhattan Refrigerating Company developed one of the earliest and most technologically advanced cold-storage facilities, based on a complex system of underground pipes that fed cooled water from the Hudson River into a huge, multi-storey warehouse that eventually would connect with the High Line, itself an innovation that opened in 1934. This little patch of land(fill) also has a long and distinguished foodie history. As early as 1879 there were outdoor farmers’ markets here; the neighborhood was filled with merchants who came from all over New York state, from Long Island to the Hudson Valley, to sell poultry, meat, seafood, eggs, butter, vegetables, beer. You can still trip over the Belgian block (also known as cobblestones) that were here long ago, or take refuge from a downpour under the metal canopies that sheltered grocers in rainy weather. The photo below is from the first decade of the 20th century and shows the area where the Whitney now stands. This year two restaurants — Santina (under the High Line) and Untitled (in the Whitney) — opened on this very spot, each in a virtual glass box with windows onto the street and a commitment to serving food made from local farmers and growers. Generations removed from the men who came here with horse and donkey carts, they include a welcome 21st century cohort: urban farmers who grow produce on rooftops in Brooklyn and Queens. But the rich food history stretches back even further: long before there was a railroad or a farmers’ market here, the area was a prime hunting and fishing grounds for the Lenape people. Using data from the Welikia Project, the 1609 shoreline map also shows the location of a Lenape Indian trail that runs over land now occupied by the handful of remaining meatpacking plants that still operate underneath the High Line and gave the neighborhood its name. The Whitney site was also important in the military history of the United States: in 1808, in anticipation of a war against Britain, a fort was hastily built here on pilings erected in the Hudson River. Known as Fort Gansevoort, it was named after the revolutionary war hero Peter Gansevoort. Some five decades later, Gansevoort’s grandson, Herman Melville, would spend almost twenty years just across the street at the Gansevoort Dock, where he worked as a Customs Inspector. All this history: food, trains, technology, soldiering. A bit of river at the edge of a forest becomes a fort, a farmers market, a multi-storey refrigerated warehouse with a railroad passing through it, a world-class park and now an art museum that urges us to look outward, through its many windows, onto the wide and complex world we inhabit. Inside, the museum deploys art and artists to push the boundaries ever farther and inspire and challenge those acts of contemplation and engagement. The whole project feels experimental, even radical. On the fifth floor, the architects provided a sitting area that runs the length of the museum and faces west, encouraging visitors to sit and contemplate the Hudson River. All day long the boats go by: water taxis, ferries, oil tankers, cargo ships, police vessels, luxury yachts, cruise ships, kayaks and barges carrying gasoline and home heating oil, like the one in my photo below. On the West Side Highway cars, trucks and motorcycles rumble along. Between the river and the highway cyclists, bladers and skateboarders glide by on the bike path. All the while, visitors in the new Whitney Museum are sitting and watching. Behind and above them, racing across the wall and visible to all those mariners, drivers, cyclists and pedestrians outside, are the “Running People” of Jonathan Borofsky, an artist known for works that capture figures in movement: people walking, running, flying. This museum, resting on its man-made foundation in a place saturated with invention and history, has taken us into a new era of art appreciation, one where we are always engaging and never quite sitting still. To learn more about the Gansevoort Market area of the West Village, read Tony Robins’ excellent walking tour which is filled with history and illustrations. Download a PDF or read it online here. Lately the High Line has been particularly magical at night. These frigid evenings seem to bring out only the hardiest of souls, and so the place is wonderfully lonely. As the sun sets the lights in the park pop on, but as you’ll notice they are all below eye level, so the light doesn’t really announce itself, and it never gets in your eyes. It shines a glow on the sleeping plants and grasses, dances shadows through the art deco rails, and provides just enough brightness to light your path. The High Line designers clearly spent as much time contemplating light in the park as they did everything else. One thing I realized on a visit last week is that the Jean Nouvel building — the one just to the north of the IAC “sail building” — still has very few tenants (or maybe they all live in Paris and Oslo), so the windows remain dark. Which lends the IAC building pride of place, at least for a little longer. I love both of these buildings and think they work gorgeously together: the combination of smooth, seemingly rounded glass surfaces of the IAC against the cut glass, recessed, multi-colored spectacle of the Nouvel. It’s one of those happy flukes of architecture when two very different, modern, buildings go up side-by-side and the beautiful and startling results appear to have been planned precisely in advance. The architectural viewscape of the High Line changes constantly, month by month — as new buildings go up — but also hour by hour with the orbit of the sun. If you spend some time walking the park at dusk you’ll see what I mean, and be sure to walk in both directions because the view is quite different heading north and south. If you get up there soon, before the weather warms up (if it ever does) you might find yourself alone, as I did, fingers frozen against the camera shutter. At the southern end, near the Gansevoort steps, you have a treat in store as you walk through the grove of birch trees. It’s like a little gallery in an art museum: one room filled with handsome young trees, lit just so. But unlike a museum, if you come back the next morning it’ll look completely different. The park is always lovely at night, but these windy, freezing, winter evenings offer up all kinds of new views and discoveries. 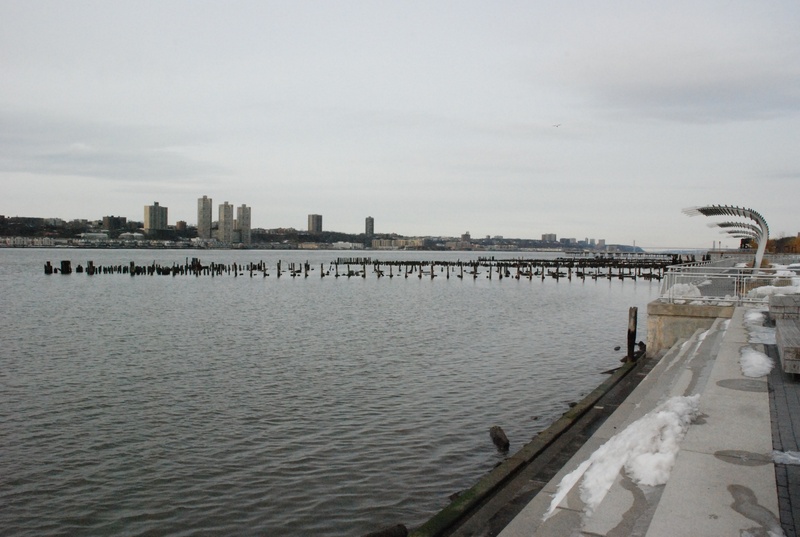 Driving down the West Side Highway last Sunday we met with a sad surprise as we approached 64th Street: Pier D was in the process of being dismantled. It was an icy day and several boats and a large crane were at work taking apart the old wreck. The Times ran a story with a photo on Tuesday and I managed to get uptown on Thursday to catch a few glimpses of the very end of the process. There were several tugboats and even a skiff carrying two men. It was so cold I could barely click the shutter; one can only imagine what it was like for those guys, hour after hour, clanking around old pieces of iron on a tugboat in the Hudson River. And here it is today. We can remember it fondly, and again thank the folks who had such vision for the City’s waterfront as they reconceived it for a 20th century visitor. Farewell old friend. So work proceeds. I’m baffled by the pace of construction projects. There are dramatic phases that go so fast — like adding an entire floor, which took just a few weeks at Our New Neighborhood Condo next door — and then long, interminable lulls where nothing seems to happen. (Wallboard installation, probably. Very boring.) A notable consequence of this “progress” is the loss of The Rat. He is now shielded from my view by the emerging 3rd floor of the condo, but I know he’s there because the horns continue to honk (labor guys in solidarity) and every time I cross 10th Avenue I have to wade through a mass of listless men drinking coffee and hanging about. Lest we forget, here is Mr. Rat, with his friends. Meantime, progress continues on the High Line. You can see hints of it in the photo above, but you have to look hard to discern the greenery that has been planted along the eastern edge of the pavers. Evergreens, grasses and little shrubs sit quietly in place between the concrete and iron. It’s still quiet down there on my little patch of unconstructed High Line, but periodically a man walks by and tips his hat to The Rat, or a new machine appears (see above; this one has its own little mat). The view from the northernmost spot that’s open to the public — on 20th Street, looking north through the chain link fence — is more promising, and shows the tremendous progress that has been made. Any day now I expect to look out my window and see an actual park emerging. I took the photo to the right with my phone, so it’s not great, but you see what I mean. One of the things I love about the High Line is how it reveals all the new architecture in our neighborhood. There’s the tilting glass building on 23rd Street — you can see it in the distance, to the left (west) in this photo — for one. But walk along the High Line and you see it everywhere, above, below, and to either side. New buildings that curve (IAC) or dance with their colored panes of glass (the new Jean Nouvel building) look out over (but never seem to tower above) older ones. The red roof of the old Guardian Angel School building, which sits across the street from Clement Moore Park (and the fabulous 192 Books) is an anchor in time. Every time I walk along the High Line I see something new, or I see something old differently. Watching it unfold before me is a wonder. The long weeks with no (apparent) progress on my section of the High Line have caused my eye to wander, and lately I’ve been admiring the majestic water towers on the roof of the London Terrace Towers apartments across the street from my apartment. (That’s 23rd Street, just off 10th Avenue.) I’m reminded of how these buildings were completed in 1929, during another severe economic meltdown. A real estate broker once told me that the builder committed suicide before the complex had been finished, but I can’t verify that. I do love how the architect conceived the housing for his water towers. See those brick silos on the roof that enclose them as though they were bell towers. Fans of Charles Kuralt will remember his fondness for the old water towers that grace so many of New York’s buildings. To him they were American heirlooms, and to give them their props he did a piece about Wallace Rosenwach, the master cooper whose family has been hand-crafting the barrels since 1896, when Rosenwach’s grandfather paid $55 to buy the business from the widow of the man he worked for. Kuralt’s book American Moments explains that every building in Manhattan that’s seven stories or more must have a large water barrel on its roof, raised up on stilts, that will supply the sprinkler system with enough water during a fire “to dampen whatever is burning while the firefighters are still on their way.” So pick a block, any block, and all you have to do is look up. There you will find “the hoops and staves of the Middle Ages” right there in the middle of our booming metropolis. Needless to say Kuralt would have loved the High Line. I thought of him recently as I was walking north near what I call “the paper clip building” on 14th Street, just a bit west of the Apple Store; the steel beams of this rising tower are so skimpy they look they come out of a Staples carton. I happened to look up and noticed a bright, oak, barrel sitting on the roof of the half-finished building. To this day the City continues to rely on the power of gravity to buy a bit of extra time for the firefighters. I’ll grab a photo of that brand new water tower as soon as I can. Watching and studying a great public space in progress has made me think a lot about the decisions that designers and architects make as they create the places that we will all inhabit and enjoy. Every weekend I drive down the West Side Highway on my way home from upstate, and it’s hard not to notice (because we’re almost always stuck in traffic) the new park that snakes its way up the bank of the Hudson River in the 60s. Look at the twisted wreck of Pier D…. This pier was originally built of wood in the 1880s and was angled in a particular way to enable rail cars to roll down and unload cargo from ships. It was destroyed by a fire in 1922, rebuilt with steel and then finally destroyed for good — by another fire — in 1971. Even the small, incidental seats that line a cement wall and are clearly intended for unceremonious sitting — tying your shoe, tightening the straps on your roller blades, enjoying a quick smoke — echo the twisted wreck of Pier D.
There’s a story in the Times about how Adrian Benepe, the parks commissioner in 2003, had to race down to the waterfront to stop a crane from dismantling the pier, which he had committed to preserving. We all owe this man a debt of gratitude, as well as the designers and architects who crafted so many decisions as they were conceiving this park. They are a source of pure delight to the eye and the spirit, whether you’re strolling along on a beautiful spring day or stuck in a traffic jam on the highway above. Walking on the High Line today I discovered that there’s still an unfinished section in the part of the park that’s open to the public. I shot a paver from that section (it’s at around 16th Street) back in mid-September, and there it was, five months later, still unfinished. There’s also a wonderful contraption called a Grasshopper, which is used to lift and move heavy materials like concrete pavers. This scene has remained untouched for months. Who knows why. When I was a kid we used to visit the church often, and it was perpetually in a state of construction. The massive building is an odd mixture of different architectural styles that seem to have evolved over centuries, so when you walk through it you get that wonderful experience that New York City often offers of old and new, one style vs. another, all somehow unified by its New York City-ness. And you also get this other sense that I felt last week on the High Line: it’s always in medias res, not quite finished, getting a touch-up or an overhaul, “under construction,” “coming soon,” whatever. There’s always the promise of something more — even, maybe, something better. So here on the High Line — itself in a perpetual state of construction — the finished part isn’t really finished yet. The sign makes no promises — “Area Closed — Work in Progress.” You can recline on a teak bench, gaze out at the Hudson River and enjoy one of the most beautiful views in the city. But the orange cones are there to remind you that the place is still unfinished. What my father always said, as we’d walk around the cathedral, is that the unfinished quality of St. John the Divine reminded him of the fact that he was unfinished too. He thought we all are — we’re each of us a work-in-progress. That, plus the fact that all this unfinished business reminded him of his grandfather who died long before his work was done, made the scaffolding, barricades and construction apparatus a perfectly natural, even beautiful part of life. I was a young grasshopper then, but I remember it like it was yesterday. Thanks, High Line.